The bitcoin scene in India at present is tremulous at best. While Bitcoin has been in the country since 2010 it has been used by only by a select group of users. The country however now has an increasing interest in this particular crypto currency due to its sudden rise. People are flocking to exchanges in order to secure the currency. Indians by culture inherently tends towards being the saving kind rather than being risk takers. 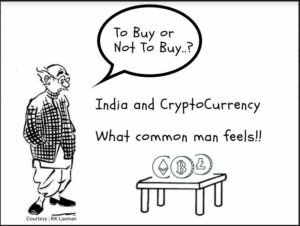 Most Indians would always prefer being on the right side of the law and due to the governments, both past and present, dragging their feet about officially accepting crypto, Indians are quite apprehensive about making any investment in Cryptocurrency. This and the obvious lack of information and resources have been the reasons for the hesitation of the average Indian while thinking of trying out crypto currencies. Of late however the boom in Bitcoin prices has given everyone in the country an awakening. Many Indians are now interested in buying Bitcoin and investing in it. While this is great for the crypto world and progress in general, there are a few points that need a little consideration. The idea behind Satoshi Nakamoto creating the bitcoin on the blockchain was not only technological but economical and social as well. Besides introducing the world to an intelligent coding system (Blockchain) that can simplify and automate several processes not only related to Banking and finance, the Blockchain technology can be used like a database for agreements. Satoshi Nakamoto observed the economics around the globe and realised that there is a lot of unfairness with regards to the way Fiat Money (regular currencies of countries) is used and controlled. Ever wondered why the dollar has more value than the Indian rupee? It’s because it is the most popular currency in the world. Have you ever heard of the Cambodian Riel that is 0.016 Indian rupees, or the Columbian Peso which is 0.023 Indian Rupees. Yes, there are several currencies in the world that are less popular than the rupee. What makes a currency have a high exchange rate? It’s completely dependent on its popularity of use. The more popular the currency, the more it is used. The more the currency is used the more its value. This is why 1 Bitcoin is approximately $10,000 (6.5 lakhs) and rising. In other words it is more widely used and more moveable across the world than the US Dollar. 3. Why are most governments across the world hesitating legalizing the use of Cryptocurrencies? What most of us are not aware of is that the economy or currencies around the world are controlled by a set group of individuals. Without sounding too radical by mentioning Freemasons and Illuminati or the Knights Templar, we need to think of a group of all those who hold power in the world – those with the financial or political power. These people may not have dramatic clandestine meetings or weird rituals but do work in sync in order to see that the rich remain rich and the poor stay poor. All in order to sustain their grasp on the power they currently hold. A decentralised currency like Bitcoin is not controlled by these people. It is controlled in all entirety by everyone who holds it. So if you hold even one unit of a currency the way you use it determines its inflation and deflation. This removes power from individuals and governments and gives the power to common people. 4. What if the Indian government declares bitcoin or crypto illegal? The question we should ask is can governments make Cryptocurrencies illegal? Yes they can. Just like holding or consumption of narcotics is illegal. This means that as per law the government can incarcerate everyone that holds any cryptocurrency. Unlike physical contrabands (like narcotics and beef) cryptocurrencies are definitely traceable on the blockchain. The government can definitely find anyone that holds crypto. Tracing those “indulging” in crypto will take a lot of time, effort and money… but it is possible. But what happens then? An Indian bitcoin exchange Zebpay says there are more than 1.5 million bitcoin users in India and 200,000 users are being added each month. Will the government be able to incarcerate that many users? Furthermore, we have to understand that our country is a Socialist, Sovereign, Democratic Republic whose government is of the people, by the people and for the people. The people are constant… governments change. With this food for thought, Indians should invest in Cryptocurrencies. Not just bitcoin but other crypto-currencies as well. While it may be a little late for the educated, lower middleclass to afford a whole Bitcoin they can buy as less as one hundred millionth of a bitcoin (i.e. 1 Satoshi). Besides bitcoin, there are several other cryptocurrencies that regular people can invest in like Etherium, Litecoin, Vertcoin, Bitcoincash etc. Do remember though that the value of a currency increases not just by hording it but by using it. So the more you use your crypto the more you contribute to its popularity and thereby its value. Also remember, that like any investment, be it property, bonds, stocks and mutual funds (so being propagated by our government) Cryptocurrencies are “”subject to market risks”….just as it is with the value of the Indian rupee or the US dollar!